Saho’s mum and step-dad are Buddhist monks and the house we are staying in is attached to a small Buddhist temple. The family Buddhist temple. I looked it up and I get the feeling that in a weird way running a temple is a bit like running any other small business - a hardware shop or fruit store. The monks provide a spiritual service, much of it around funeral rites, and they are paid for that service, although their income comes from donations, rather than set fees. Monks aren’t supposed to expect financial reward for what they do, though of course they have to feed their families and maintain their temples. Often temples are passed down from father to son, as I think was the case with this one. The temple itself isn’t used a lot - unlike, say, a parish church or a mosque. The annual August children’s festival fell the day I arrived, which was a big event, with a marquee set up in the courtyard and the area decorated with dozens of lanterns with children’s names on in beautiful Chinese characters. A group of women, led by Saho’s mum, sat on the porch of the temple and chanted and dinged handbells, while outside Saho’s step-dad chanted in front of the shrine and rang a larger bell. People queued up and bowed in front of the shrine, and prayed for the health of their children, who were given goodie bags with snacks in. 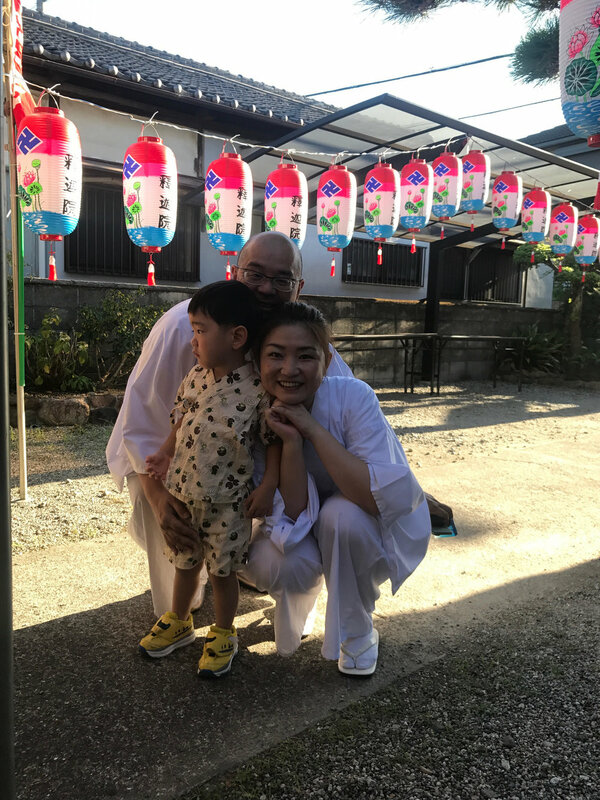 But by the next morning, everything had been packed away, and apart from the odd morning where I’ve heard either Yoshi (Saho’s step dad) or Yuri (Saho’s mum) chanting in the temple, nothing much has happened since. Instead, Yoshi puts on his robes (black for normal work, purple for funeral rites) on top of his white under-robes, and heads off in his car, presumably to people’s houses. He changes back into jeans and a t-shirt when he gets home. There are currently around 75,000 temples in Japan - 50% more temples than there are convenience stores, apparently. But as with Christian churches, people are worried about their decline, as younger people lose the connection with their religion and choose cheaper, secular burial options. One article I read suggested 30% of Japanese temples could close by 2040, with ones in rural areas most at risk. The Shitennoji temple in central Osaka is somewhat bigger than the one here! I read, in the Irish Times of all places, that Japanese temples face new competition from rent-a-monk services, which offer Buddhist funeral blessings at a fixed price. This has the advantage of being cheaper than the going rate, but it also offers certainty for people bemused by an often obscure donation system, the paper says. Meanwhile, some monks have opened bars or cafés attached to their temples, as a way to bring people back; one did an MBA as a way to modernise the way he ran his business. I have no idea how Saho’s parents’ family temple is going, but it seems flourishing - the buildings are beautifully maintained and the work seems to provide a good living. I hope so, because it’s certainly a very cool place to be staying.